Take an adventurous dry season safari exploring the rugged Reynolds River track through remote parts of Litchfield National Park. Swim at rarely-visited Surprise Creek Falls. See the riverside community of of Nauiyu. Drop a line for a barramundi in the famous Daly River, the largest river in the Top End. Have an adventure that few others have experienced. This charter is only available from June to November, as park authorities close the Reynolds River track for the rest of the year due to wet season flooding. Your personable Aboriginal guide will treat you to the real story of the area with fun and laughter. You’ll be picked up from your hotel and travel in a safe, comfortable, air-conditioned Landcruiser 200 GXL four-wheel drive vehicle. You’ll discover spectacular landscapes, fascinating pioneer heritage and a rich Aboriginal tradition. You’ll splash about and swim in clear, natural pools, out of the reach of crocodiles. You’ll enjoy freshly cooked wild-caught barramundi, crocodile and kangaroo for lunch by the Reynolds River. From your Darwin hotel we’ll take the back roads south to the Finniss River crossing*. We’ll stretch our legs at this shady riverside stop. A few kilometres along the Reynolds River track* and two creek crossings later we’ll reach Blyth Homestead, the heritage-listed childhood home of Tess’s Uncle Max Sargent and Aunty Esther. Get a taste of life in the old days, living off cattle, tin and veggies in this rugged environment. Your Aboriginal guide will show you seasonal bush foods and medicines. You’ll be amazed at the uses of termite mounds! Refresh yourself with a cool swim at this remote and crystal clear series of plunge pools. After a visit to the Nauiyu community, throw in a line and try for the Top End’s iconic barramundi at the Daly River crossing. 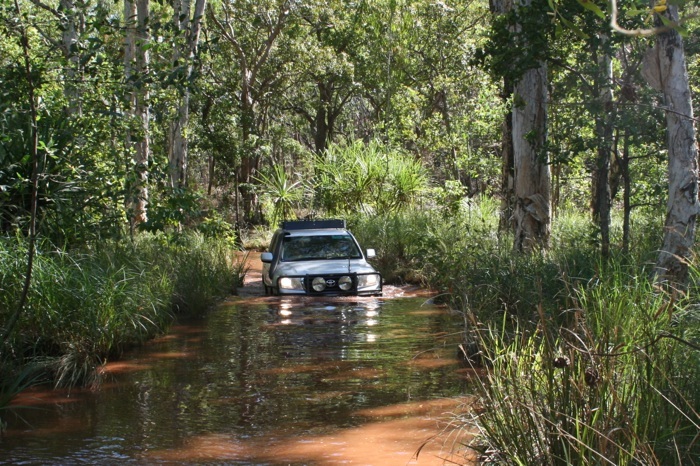 Settle back into your air-conditioned Landcruiser as you return to Darwin via Adelaide River township. Price includes hotel pick-up and drop-off, transport in a safe, comfortable 4WD LandCruiser 200 GXL and a delicious lunch of freshly cooked wild caught barramundi, crocodile and kangaroo for up to seven passengers. If you are not fully satisfied with the quality of your tour, we will fully refund the tour price to you. We endeavour to meet, but cannot guarantee, exact pick-up and drop-off times, nor that Tess Atie will be available to lead every tour. We reserve the right to amend tour times and itineraries, without refund, due to road or area closures, emergency incidents, extreme weather events or other unforeseen circumstances to ensure the safety of our guests. If the Bureau of Meteorology issues a tropical cyclone warning (meaning destructive winds are occurring or expected within 24 hours), we will cancel tours scheduled for the warning period. We reserve the right to sell tours at special prices lower than the advertised retail rate, from time to time. We will charge you a minimum $30 administration fee if you require us to amend or cancel a confirmed tour. If you cancel a confirmed tour less than one month before departure, we will only refund 70% of the tour price. If you cancel a confirmed tour less than one week before departure, we will not refund any part of the tour price. We reserve the right to cancel a tour that has only one person booked. In this happens, or if an exceptional and unforeseen circumstance forces us to cancel a tour before departure, we will fully refund the tour price to you.